After years of renovating houses and working on a farm, Tommie’s shoulder had worn out, causing her to struggle to do household chores or to write on the board in her classroom. She received injections to help the pain, but they lasted only a short time, leading her to seek a long-term solution. Retired Lakewood resident Nellie Sparks started having problems with her left shoulder about four to five years ago. She first noticed the problem when she tried to take a pose in yoga, and realized she wasn’t as flexible as she should have been. Putting stress on it caused a lot of pain, but Nellie put it off getting addressed for a while, using cortisone shots to get her by. John Bowling of Hollywood, Maryland, suffered from serious shoulder pain for years and in 2015, it started to interfere with his everyday activities as a farm owner. When the pain escalated to where he could no longer perform simple tasks, such as dressing himself, his wife made an appointment for John with Dr. Peter Johnston of the Southern Maryland Orthopedic and Sports Medicine Center. This article addresses how large medical technology companies have been slow to pick up the ball with regard to small joints and replacements. 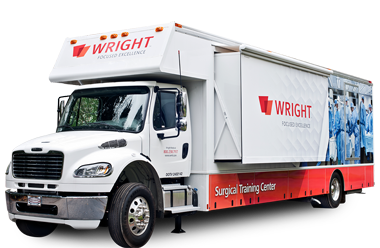 This has left an opening that small and mid-size companies like Wright Medical Technologies have been able to fill while helping aid patients with joint distress in the extremities caused by arthritis, obesity, and other problems. This article profiles Ricky Rummage, who was tired of wearing casts when he broke his wrist. Rather than deal with a cast, which would leave him immobilized for weeks, Rummage opted to try Wright Medical Group’s minimally invasive wrist treatment, MICRONAIL® Fixation. Rather than wrapping the wrist to heal, MICRONAIL® Fixation lets the wrist heal from inside, allowing the patient mobility much sooner, with smaller scars – and with much less pain than with traditional techniques. Dr. Brian Schaefer of Orthopaedic Associates in Cape Girardeau relates and how he has embraced Wright’s MICRONAIL® Fixation system for many broken wrists, allowing patients to heal faster and have a greater range of motion. The MICRONAIL® implant uses an internal fixation technique and results in little more than a removable splint for the patient to wear after the surgery. Schaefer sees many benefits to the new procedure that outweigh those of traditional bone-setting techniques like casts. Although many wrist fractures are treated with a cast or a combination of cast and pins, such treatments can fail to maintain the bone alignment. By some estimates, 70 percent of patients experience pain and/or decreased wrist function because of alignment problems. Dr. Samir Sodha has been using the Wright MICRONAIL® implant, thus allowing his patients immediate use of their wrist with minimal scarring and mobility loss.